Recently completed commissions include large scale works in the city of Pueblo and at the University of Southern Colorado campus. Darpino has also been featured on NPR radio, public television, and is featured in two videos discussing sculpting and the casting of bronze sculptures. Here's all you need to know about Fred Darpino. He had molded the clay form of Nick Venetucci. Everything was fine. It was on its way to becoming an excellent sculpture. There was just this one nagging thought: The figure, to his eye at least, was out of proportion - 2 inches too short. He couldn't just let the minor discrepancy go. “It would have bugged me forever,” Darpino said. So he decided to rework the clay a bit, adding the two inches to the legs. He told himself he could do that easily without changing the rest of the statue. Wrong. “By the time I was through, I'd redone all of it,” he said. Fred Darpino works on a portion of the statue, which depicts Nick Venetucci helping a youngster with a large pumpkin. Such attention to minute detail has been routine ever since the Manitou Springs Business of Art Center sculptor began the project last June. "I must have started over about 30 times," he said. He's a perfectionist, but usually not that bad. It's just that Venetucci has a special place in Darpino's heart. A former District 11 school teacher, for 30 years he took many a child to the Venetucci farm south of Colorado Springs for free pumpkins every fall. He saw with his own eyes the man's generosity. Now 93, Venetucci gave out pumpkins to busload after busload of schoolchidren for 50 years. The streak came to an end two years ago when the drought was at its peak. "He said he couldn't get a shovel into the ground," Darpino recalled in a recent presentation to students, parents, staff and the general public at Pike Elementary. "So the teachers said, 'Since he can't do this for us, let's do something for him.'" That was how the idea came up for a sculpture to commemorate the "pumpkin man." Area schoolchildren have joined the effort, contributing a total of about $34,000 through the "Pennies for Pumpkins" to help with the estimated $100,000 cost. The design, nearing final form (he hopes) in Darpino's studio, shows Venetucci giving a sizable pumpkin to a beaming child, while close by another youngster rolls an even bigger pumpkin along. The rolling-pumpkin scenario was drawn from Darpino's memories of his visits - "The kids would always take pumpkins that were too big" - and from talks with Venetucci about how the sculpture should look. "I asked Nick what he remembered most and he said it was the kids trying to push the pumpkins that were too big," Darpino said. Another set of true-to-life detail, in the background, will be a baseball jersey, with bats and a catcher's glove, Darpino said. This references Venetucci's youthful baseball talent. A Triple-A player in the Yankees' farm system, he was forced to quit that career to run the family farm when his father took ill.
Darpino has been creating bronze sculptures for about 20 years. His works include the girl scooping water piece in front of the Loop building in Manitou, as well as pieces commissioned by the City of Colorado Springs that are likely to be placed in Confluence Park, he said. Colorado Springs memorialized in bronze on the lawn of the Pioneers Museum downtown. Almost overnight, the statue seemingly came to life as large pumpkin vines sprouted in the flower bed that surrounds it. The vines have obliterated pansies planted earlier in the summer, and they've given birth to gourds that swell with each afternoon shower. Today, the vines are kneehigh on the statue honoring the Security farmer. It's a pose thousands of area residents would recognize: Venetucci smiling amid growing pumpkins. 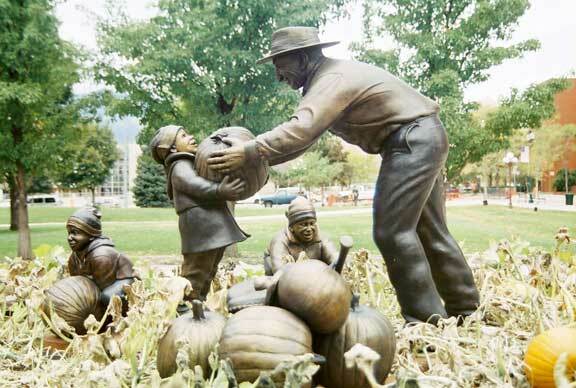 Before his death Sept. 7, 2004, he became a legend for giving pumpkins to area schoolchildren over a 50-year period. "It really looks great," said Matt Mayberry, museum director. "It's such a fitting tribute to Venetucci." Venetucci's trademark. Some of the vines are spilling onto the sidewalk, and others are slightly obscuring the three bronze children who surround Venetucci in artist Fred Darpino's sculpture. Again, Mayberry thinks it only adds to the effect. "It really looks great with the kids there in the pumpkin patch," he said. Others agree, including Suzanne Royer, who spearheaded the "Pennies for Pumpkins" campaign that raised more than $100,000 to pay for the statue. "I love it," Royer said. -- to the farm to gather free pumpkins. She has made several visits to the statue since it was unveiled last October and is tickled by the growing vines. and it's so nice to see they love him, too." So, just who is responsible for the pumpkins, anyway? Neither Royer nor Bambi Venetucci knew the answer. And it wasn't the city gardners who planted them, said Paul Butcher, director of the Parks Department. "We don't plant vegetables and fruits that can be consumed," he said. Could it have been magic? Maybe a little pumpkin dust sprinkled in the dirt? Actually, it was Beth Kosley of the Downtown Partnership. "We planted pumpkin seeds at the request of the museum and the artist," Kosley said, noting how the vines are really taking off. "I'm a little worried we're having too much success." No way, say Mayberry, Royer and the others. Their only fear is that the pumpkins might disappear. "We're a little bit worried," Mayberry said. "We'll just have to see what happens. It will be great if we can get to middle or late October and have bright pumpkins in there. "We'll have to see how the public reacts to it."